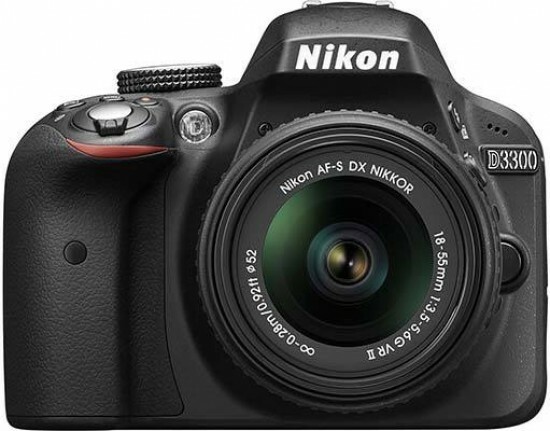 The Nikon D3300 is an entry-level digital SLR camera boasting a 24.2 megapixel DX format APS-C sensor with no anti-aliasing filter and the latest EXPEED 4 processor. The D3300 also features 5fps continuous shooting, a 3 inch 921k-dot LCD monitor, one-touch full 1080p HD video recording with autofocus, quick-access Live View mode, ISO range of 100-25600, 11-point autofocus system with a cross-type sensor in the centre for greater accuracy, 13 special effects, easy panorama mode, and an interactive Guide Mode. 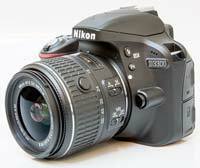 The Nikon D3300 is available in black, red or grey priced at £499.99 / €599.99 for the body only. 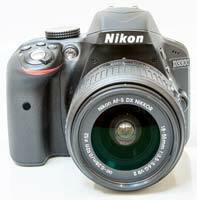 and £599.99 / €719.00 / $649.95 with the new Nikkor 18-55mm VR II retractable kit lens. The D3300 is compatibile with Nikon’s separately sold ME-1 Stereo Microphone and Wu-1a Mobile Adapter. The design of the new Nikon D3300 is virtually identical to it's 12-month old predecessor, the D3200. The Nikon D3300 is a rather small DSLR camera, although it does come with an even chunkier right-hand grip than the D3200, with a more pronounced lip at the top. Still, expect having to find a place for your little finger under the camera if you have larger-than-average hands. The camera body itself is mainly plastic, but while the D3300 certainly doesn't feel as robust as some of the company's higher specified models, it still exudes a degree of quality you might not expect at this price point. This is helped by the surprisingly classy rubber coating on the grip, which also appears on the thumb rest on the back of the camera. The Nikon D3300's body is almost identical to its predecessor in terms of the overall dimensions and weight, with all of the external controls in pretty much the same places as before. The new ‘i’ button on the back of the camera makes it possible to bypass the main menu in order to quickly change key settings. The new 18-55mm f/3.5-5.6 VR II kit lens that ships with the D3300 is one of the main talking points of the D3300. For the first time Nikon have implemented a retractable design to make the lens more portable when it's not in use, something that quite a lot of compact system cameras have in their lens ranges. As a result the 18-55mm f/3.5-5.6 VR II is much more compact thatn its predecessor when retracted to the L position, although of course you still have to extend it outwards to start shooting. 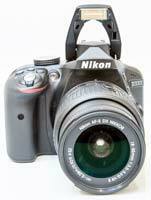 The new optic now feels better-balanced on the Nikon D3300 and it fits into place with a reassuring mechanical click. It also adds the very important advantage of Vibration Reduction. Nikon bodies don't offer any form of in-camera image stabilisation, unlike similar models from Sony, Pentax and Olympus, so the affordable 18-55mm VR II lens is a good partner for the D3300. We'll publish an in-depth review of the 18-55mm f/3.5-5.6 VR II lens very soon. The Nikon D3300 follows conventional DSLR design in having a shooting mode dial on the top of the camera, which allows you to select either one of the advanced modes like Manual, Aperture- or Shutter-priority, or a number of scene modes. The Guide mode first seen in the D3000 has also been carried over, and includes sample images to help you to identify the shot, and options in the Advanced operation menu help you to reduce blur or soften backgrounds. The main purpose of the Guide mode remains the same as on the D3000, D3100 and D3200, namely to teach beginners about what settings to use in a number of shooting situations, and how these settings influence the final output. We feel that Nikon deserves kudos for this, as a mode like this can teach beginners a lot more about the basics of photography than the green Auto mode in which the camera assumes control of almost everything. The Effects shooting mode, first introduced on the higher-end D5100, has been added to the D3300 and provides 13 different filters that can be applied to both still images and movies. The Night Vision effect is particularly worth of mention, pushing the camera's sensitivity to a whopping ISO 102,400, although a monochrome rather than colour image is recorded. For stills, you can enter Live View mode to preview the effect or simply use the optical viewfinder. For movies, the recording is slowed down (dependent upon the chosen effect) as the camera uses a lot of processing power to apply the effect, leading to footage that can have a rather staccato feel. Note also that the camera sets virtually everything in the Effects mode - exposure, shutter speed, white balance, ISO, file type and quality - so its only creative in terms of the arty effect that's applied. Several of the same effects can be applied to an image or movie that you've taken, though, so you can have the best of both worlds (albeit without the luxury of a preview). 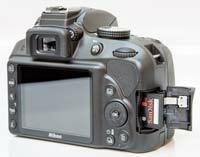 The Exposure Compensation button is thoughtfully positioned next to the shutter release. Hold down this button with your right forefinger and spin the control wheel on the top-rear of the camera with your thumb to adjust its settings - simple and intuitive. In M mode, this easy-to-reach button allows you to toggle between aperture and shutter speed settings, making the lack of a second control wheel less problematic. The second button sitting next to the shutter release, labelled 'info', is arguably at the heart of the Nikon D3300's ease-of-use, as the camera lacks the monochromatic status LCD of more expensive models like the D7100, so Nikon had to provide a different way to check vital shooting information without having to look into the viewfinder. Enter the info button - pressing it displays virtually all of the camera's main settings on the large, high resolution rear screen. 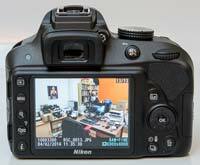 The same screen is used for the D3300's Live View and movie recording modes. As noted above, the Nikon D3300 has a small button on the back which makes entering Live View a very easy and simple affair. In Live View the camera autofocuses using the contrast detect method. 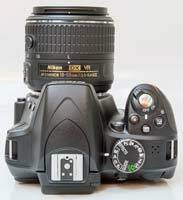 Depending on the AF mode set, you can either initiate this via a half-press of the shutter release, or have the camera keep focusing continuously. The first method is noticeably faster than on earlier models, though still not nearly as quick as the phase detection method used outside Live View. The other autofocus mode, called full-time AF, can be more of an annoyance than a benefit, as the picture might go out of focus just before you wanted to take a shot (though you can at least lock focus by half-pressing the shutter release when you think focus is where it should be). Of course you can also focus manually while in Live View mode. As with earlier LV-enabled models, it is possible to magnify into the live image by repeatedly pressing the button labelled with a loupe icon - however, due to what appears to be a lo-res live view feed, this magnification is not much help. On a related note, it's also annoying that Nikon still doesn't offer a live histogram to help you get the exposure right when working in Live View mode. The Nikon D3300 features a 1080p Full HD “D-movie” mode. At the highest resolution setting, the camera can record movies at 60p/50p/30p/25p/24p, while at 1280x720 pixels you can choose from 60p/50p. The Nikon D3300 offers full-time autofocus in movie mode, but you may quickly decide to turn this feature off. For one thing, the sound of the focus motor in the lens gets picked up by the microphone. For another, the subject may go out of focus for no apparent reason. If you really want to make sure an erratically moving subject stays sharp throughout the clip, you had better stop down the lens for enough depth of field to work with, and leave all shallow-depth-of-field trickery to static or predictably moving subjects. There is an element of exposure control when shooting movies. Both the aperture and the shutter speed can be pre-set before you start filming and changed whilst shooting, a welcome boon to your creativity. By default, exposure changes with subject luminance while capturing a clip, although you can at least lock exposure by holding down the AE Lock button. The camera does not provide any special feedback on focus or highlight blow-out (i.e. no “peaking” or “zebras” like in professional video cameras), but there is manual control over audio levels and sound is recorded by way of the built-in stereo microphone. You can also hook the D3300 up to an optional external stereo mic to improve the audio quality. Videos are compressed using the H.264 codec and stored in a MOV container. Like all SLRs, the D3300 has a proper through-the-lens optical viewfinder. It's not as large as that of a D7100, for example, but at 0.85x magnification it is slightly larger than the D3200's. The positions of the 11 autofocus sensors are permanently but unobtrusively marked on the focusing screen with 11 tiny dots. In single-point AF mode - in which you can specify which AF point the camera should use - the active autofocus point lights up in red upon a half-press of the shutter release. The other available AF area modes include Auto Area, Dynamic Area and 3D Tracking. Autofocus speeds with the new kit zoom were snappy, and focusing with the optical viewfinder is still a lot faster than in Live View mode. Just like most other entry-level Nikon dSLRs, the Nikon D3300 lacks a body-integral focus motor, so it can only autofocus with AF-S and AF-I lenses which have the AF motor built in. 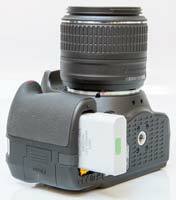 Other AF Nikkors can be used in manual-focus mode only, although the AF sensors remain active and can at least provide focus confirmation via the green dot in the in-finder LCD. There is also an “electronic rangefinder” function that can be enabled via the menu; this tells you how far you are from perfect focus, and which way you need to rotate the focus ring to acquire it. Manual-focus AI and AI-s lenses without a CPU can only be used in M mode, and the camera will refuse to provide any form of metering, so you will either have to use an external meter or take a few test shots to determine the optimal exposure. Focus confirmation, however, works with these lenses too, via the green dot; albeit the afore-mentioned “electronic rangefinder” functionality is disabled. One interesting thing we found is that if you shoot a D-movie using a non-CPU lens, the camera will adjust exposure normally, so the lack of metering only applies to stills. For the images already captured, the Nikon D3300 offers a broad range of retouching tools, including post-capture D-lighting (useful if you forgot to turn on Active D-lighting before capture), red-eye correction, trimming, monochrome conversion, different filter effects, colour balancing, image resizing, image overlay, in-camera raw processing, distortion correction, and a miniature effect that mimics a look that can otherwise only be achieved with a tilt lens. Many of these functions make it unnecessary to buy specialised computer programs or plug-ins and spend hours in front of a computer to achieve a desired/popular effect. The Nikon D3300 is powered by a proprietary Lithium-ion battery that offers 700-shot life, and ships with a cordless charger that plugs directly into a mains socket. For storage, the camera uses SD, SDHC and SDXC memory cards. As far as connectivity goes, there are A/V Out, mini HDMI and USB terminals, a proprietary connector for an optional cable release or GPS unit, and the already mentioned external microphone socket.